In this Corner Stats let's analyze the Pace calculation. Welcome back to Corner Stats! First of all, happy new year! 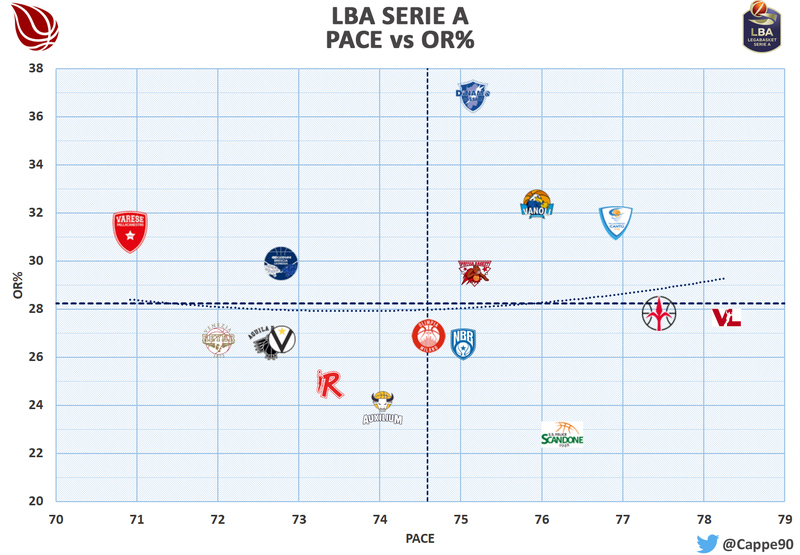 The first post of 2019 is a very specific analysis: in the last days, I was wondering what generates the difference of 4/5 possessions between the Serie A and EuroLeague Pace. From this simple curiosity, I created a more depth analysis of Pace. In the first table, you find the data “per game” of the various League statistics, while in the second you find the ratio of these values with the Pace. In this way we identify the relative influence of each individual value on the average Pace: we can observe that the free throws have equal weight and that the field shots (the sum of 2PA and 3PA) are equivalent. What is slightly different are the lost balls and the offensive rebounds. Let’s analyze one term at a time. Opposed to what can be expected, the highest value of turnovers are in Euroleague; clearly, we are talking about small differences, but the substance is that. However, a lost ball can generate different effects on the Pace: if the ball remains active (stolen by the opponent) it will most likely generate a fast break; if instead, it is a lost for offensive foul or other infractions, the turnover will not generate a transition, but a normal possession, since it will be necessary to resume the game with a throw-in. So I made a check: I subtracted the steals from the turnovers, finding, in a rough way, the number of inactive turnovers in the two leagues. I say “rough” because not all the steal generates a transition. Therefore we can observe that in EuroLeague the inactive turnovers are 8.2 per 100 possessions, while in LBA are 7.9 per 100 possessions. 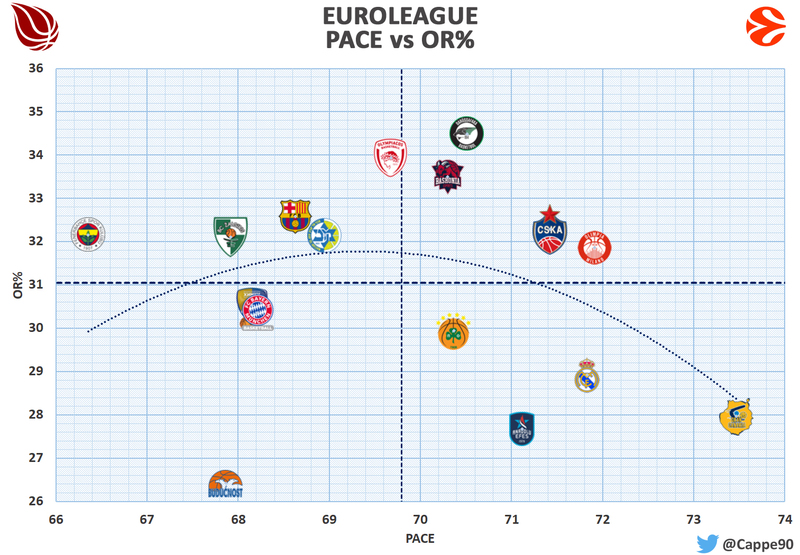 Again the differences are small, but the greater value of the EuroLeague gives us one of the reasons behind the Pace difference: the maximum European competition tends to generate less fastbreak after a lost ball, thus reducing the average Pace. On this fact, we will be back soon. Let us now focus on the second term of influence, the offensive rebound. As I have already repeated many times, an offensive rebound does not generate a new possession; in fact, in the formula that estimates the number of possessions played, the offensive rebounds are subtracted from the other terms that identify the conclusion of a possession (shots and turnovers). By definition, therefore, the value of offensive rebounds is the term that lowers the Pace (or increases the duration of individual possession): with the same number of shots attempted and turnovers, the greater is the number of offensive rebounds, the lower will be the average Pace. Therefore, the values calculated in the second table explain to us the difference in this case too: EuroLeague teams capture more offensive rebounds, thus increasing the length of individual possession. Let’s observe the advanced statistics: the average OR% in EuroLeague is 31.1, while in LBA it is equal to 28.2. In conclusion, the possessions difference between Italy and Europe is due to slight differences in inactive turnovers and offensive rebounds; obviously, these two factors are not the only ones to create those 4-5 more possessions, because the differences are not so great. In LBA there is the tendency to end the single possession more quickly, a condition probably due to the fact that the defensive quality is worse than Euroleague: this generates more defensive mistakes that turn into shooting opportunities. After these conclusions, however, a second question has arisen: is it right to not consider the offensive rebounds as generators of a new possession? The possessions have been defined by Oliver during the Offensive and Defensive Rating calculations: obviously, if the offensive rebounds do not generate further possessions, it is because there are several reasons behind. It multiplies the offensive rebound percentage and the missed shots: in other words, the offensive rebounds grabbed after a missed free throw are not taken into account. This is because it is rare that this happens and because you can not know from a normal box-score the correct number of free throws that started a new action. This formula is therefore designed to optimize the value of offensive rebounds to be subtracted. Pay attention, I’m using the advanced statistics of rebounds just to separate from the correlation between Pace and rebounding chance created (which obviously grow linearly together): intersecting the values of the individual games you can notice how the more the pace increases, the less Offensive rebounds are grabbed. 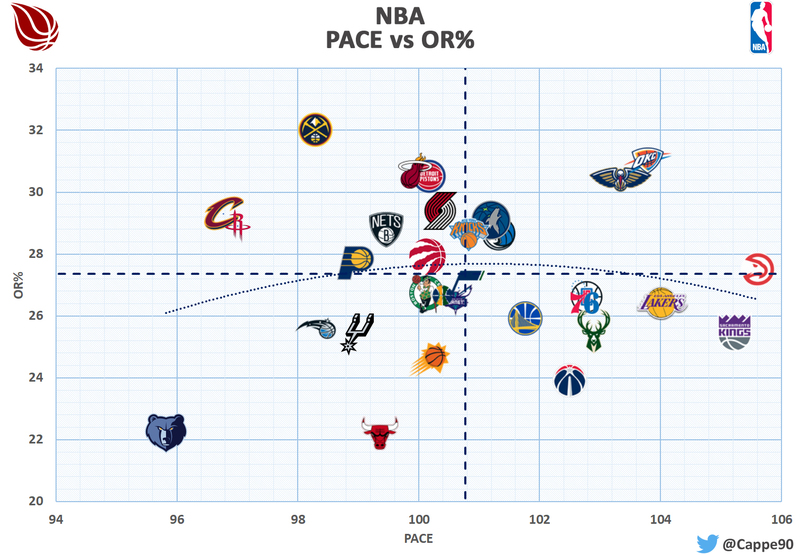 The distribution in the various charts is heterogeneous and does not confirm this fact: in conclusion, we can say that the single-game influences the single rebounding performance; for example, if a team that usually plays at a low pace encounters with a high-pace team and accepts the high pace, it will probably capture fewer rebounds in that single game. 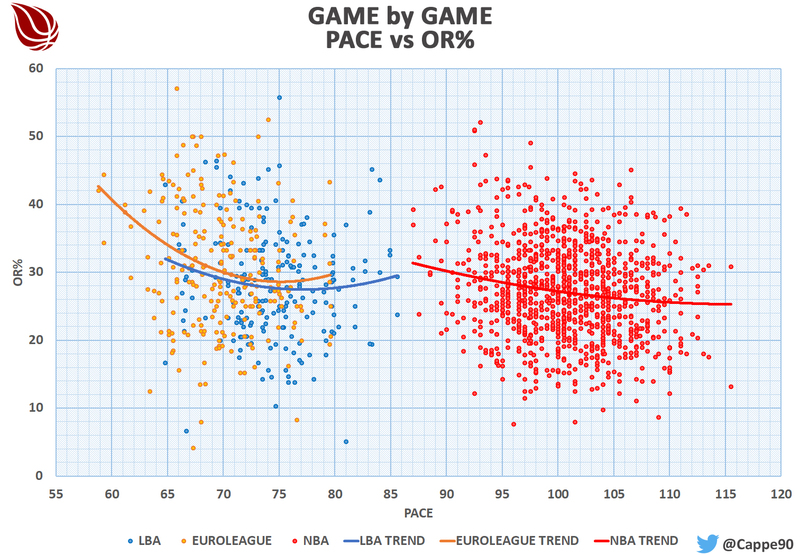 Actually, however, the offensive rebound performances are not strongly influenced by the pace. The pace is, therefore, an estimate of half-court changes, but also reflects the tendency of a team to push more or less in transition. A team with high pace, however, is not necessarily one who likes to make fastbreaks: we can say that high pace is a necessary condition, but not sufficient to identify teams with a transition tendency. To better analyze this propensity it is useful to refer to other data.